Packaged in a protective atmosphere.Although every care has been taken to remove bones, some may remain.Minced meat product require thorough cooking before consumption.Packaged in a protective atmosphere.Although every care has been taken to remove bones, some may remain.Minced meat products require thorough cooking before consumption. Tip: Before adding ingredients ensure mince is fully browned. Heat a little oil in a pan until hot. 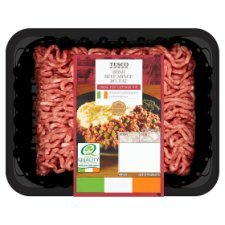 Remove mince from packaging and add to the pan. Brown the mince, stirring frequently for 6-8 minutes. Lower the heat to medium and continue until cooked thoroughly.